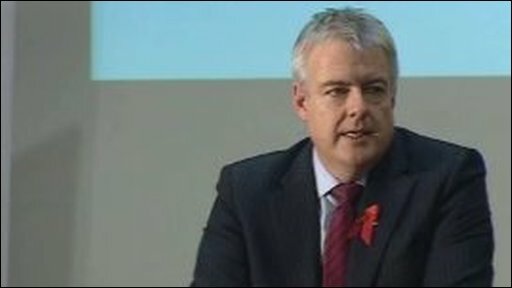 Carwyn Jones said in his victory acceptance speech he was proud to be "Welsh, British and Labour"
Carwyn Jones has won the race to succeed Rhodri Morgan as leader of Labour in Wales and to become first minister in the Welsh assembly. The long-term favourite, a 42-year-old barrister, said the party had a "great task" ahead after a "difficult few years" but "there are no no-go areas". Prime Minister Gordon Brown said the Bridgend AM would be a "true fighter for all the people of Wales". He won in the first round against his two rivals, with 52% of the vote. Mr Brown offered his congratulations and said: "I know that Carwyn will make taking on the Tories a priority: they would be a change that Wales cannot afford". Mr Jones beat Health Minister Edwina Hart, with 29%, and backbench Assembly Member Huw Lewis, who had 19%. Former Welsh Secretary Paul Murphy last week urged the winner to appoint the other two candidates to the new cabinet. But Mr Jones said shortly after his victory that it was too early to say who will be in his cabinet. He is due to replace Mr Morgan as first minister next week, and said he hoped to name his team at the end of that week. The sweeping victory followed a vote of Welsh party members, affiliated groups such as trade unions, MPs, AMs and its only Wales MEP. Politics: Bridgend councillor, 1995-2000, Bridgend AM, 1999 to date, various ministerial roles, including rural affairs, open government, environment, currently counsel general. Mr Morgan will officially step down next week after nearly 10 years and his successor said it was "particularly humbling to follow Rhodri as leader of Welsh Labour". Describing the leadership race as a "a great contest for our party", Mr Jones said it had demonstrated Labour was "above all , the party of ideas in Wales... we are still, and always will be the party of Wales". Thanking his defeated rivals for running "excellent campaigns", Mr Jones said "we began this election as friends and we end the election as friends". Repeating his campaign pledge to be a leader for the whole of Wales, he said: "We know that Welsh Labour is at its best when it's united... we're a very formidable force when we work together". To warm applause, Mr Jones promised to be "at the forefront" of the general election campaign next spring "to make sure that we get as many Welsh Labour MPs elected as possible and... make sure that we get a Labour government elected in the United Kingdom in 2010". "We need it, our people need it and we need to make sure that we deliver it," he insisted. He told the party it had to "listen" and "learn" to "win back Wales". Proclaiming that he was "proud to be Welsh, I'm proud to be British and I'm proud to be Labour". Looking ahead to tough elections over the next two years and beyond, he said "tonight, let's just say that in this building, at this event, that tonight our fightback starts". Mr Jones is currently counsel general - the assembly government's chief legal adviser - in the Labour coalition assembly government with Plaid Cymru. As leader of the house, he is also in charge of getting government business through the assembly. The two-month election campaign began formally when Mr Morgan confirmed on 1 October that he was standing down, shortly after his 70th birthday. BBC Welsh affairs editor Vaughan Roderick said Mr Jones' victory had been expected in the electoral college vote, given his large support from Welsh MPs at Westminster. In her speech, Mrs Hart told the party faithful she had had a ""fantastic time" on the campaign trail, the election, she said, had "brought us together as a party". For the future, she advised Labour to "stand firm, say what we've done since 1997, say what we'll do in the future and really work together". "We've had this election campaign now, it's a question of moving on, getting united and doing the business. "So tomorrow, I don't know about you, have a little rest and a drink perhaps tonight, but start rolling your sleeves up tomorrow because we've got big campaigns to win in the future," she added. Mr Lewis said Mr Jones's "emphatic win" had shown "the worth of the message that he carried to the party and the wider Labour movement". He said Mr Jones would "have the full and unequivocal backing of ourselves as former candidates and ourselves as party members, trade unionists and affiliates across Wales". "You go out there now, with our backing, and you do us proud." Mr Morgan has held the top job in Wales since February 2000, and said now was the right time to go. Let's hope his commitments to the One Wales agreement are a priority and we get our referendum before the General Election. If he ensures a provision for education in Wales that gives every child the same opportunities as he has had, he is the right choice. Congratulations to Carwyn Jones. Good choice. I met Carwyn Jones two years ago and thought what a nice bloke and very bright. He visited our Action for Children tent despite being pushed for time and came over as very sincere and genuine. Looking forward to seeing how he gets on and I do hope he makes an impact for Wales and its people. I think the comments of being proud to be 'Welsh, British, and Labour' really resound to how a lot of us here in Wales feel. Carwyn can do a great job for Wales. An excellent choice for Wales. Carwyn has the right attitude and resilience for the job and challenges ahead. Politically astute, warm and caring, a leader to unite the whole of Wales.